The fact that we are basically smart monkeys underlies a lot of our not-so-smart behaviour but Mike McRae focuses on only one aspect of it, that is, how it affects our relationship with science. On one level we know we know science is our best means for discovering the truth, but on another we distrust it. McRae wanted to find out why, since our distrust encourages irrational and potentially dangerous responses to real-world problems. His evolutionary history of our big brains leads into a brief history of philosophy and science. A recurring theme is that our social relationships, still tribal after all these years, often trump our rationality and make us reluctant to oppose authority or stand out from the crowd by accepting an idea which is rejected by most of our tribe. He doesn’t discuss the reception of climate science in any detail but that, to me, would have been the perfect case study, demonstrating all of the features he mentions. Thinking about how we think is often fun, and Tribal Science is far more entertaining than my quick summary suggests, rambling amiably through scientific errors and frauds, logic puzzles and psychology. Thanks for the review, Malcolm. And your point about climate science being perfect fodder for the social-brain explanation of human irrationality is one I’ve had leveled at me a couple of times. For good reason, too – it’s completely right. I had toyed with the idea of including a section on AGW in the book, and even had a rough outline for it at one point. My reason for not taking it further was in some small ways a rather cowardly one – I wanted to limit any perception of some current (rather socially controversial, even if scientifically settled) political agenda in order to not detract from the core theme. In my day job I create educational resources; one of my main projects even includes one of Australia’s biggest climate change educational resources. So I’m certainly in favour of promoting good science literacy and critical thinking with regards to AGW. I just wasn’t quite convinced at the time of writing the book that I was capable of doing the concept justice with respect to the book’s themes and the current social climate, without it seeming as if I was pushing deeper messages. That said, hindsight and experience are great things. Should I ever get an opportunity to do another version, I think I would have more confidence to include something substantial on the topic. There is even potential for an entire book on a similar topic. I’ve also had interest in developing an educational companion resource for the book, which would certainly present climate change as a topic to consider in light of the book’s theme. 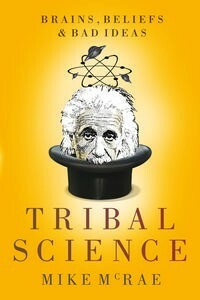 Thanks once again for reviewing Tribal Science, and I’m so glad you found it an enjoyable read. I do understand shying away from using AGW as an example in your book. Given the passions it excites, it could very easily have unbalanced the book either by making the whole book appear political and/or by needing too much space for the thorough treatment it would demand. James Woodford had a similar issue to deal with in his recent The Great Barrier Reef. He wanted to talk about the reef as it is and its prospects for the future, and had to limit his discussion of AGW (although it will undoubtedly have a large influence on the reef’s future) to avoid turning the book into an environmentalist tract.